Performing Arts Center, situated at the corner of the South and Southeast buildings, hosts a multitude of activities ranging from assemblies and plays to our annual school musical production and 8th and 12th Grade graduation ceremonies. The facility has a seating capacity of over 550 and also houses the Music and Drama classrooms. 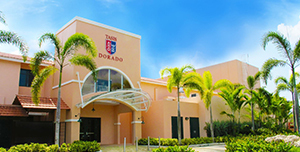 With a seating capacity of 528, the TASIS Dorado Performing Arts Center (PAC) is a state-of-the-art venue, designed by architect Otto Reyes. Acoustical engineers, led by Eduardo Cortés of the PRISA Group, constructed an aural environment suitable for concert orchestras, musicals, chamber music, a Capella music, lectures and more, supported by sound and lighting features to enhance any performance. The stage has a removable front platform, revealing an orchestra pit for 30 musicians and a double-height fly space for scenery and curtains. Its 528 cushioned seats are part of a telescoping system that retracts to provide a clear floor space of over 4,200 sq ft—perfect for exhibitions, dances and many other activities. The back of the house includes two fully-equipped dressing rooms, scenery workspace, loading dock and a full-featured control booth. The PAC is a jewel in the Greater Dorado area and an important cultural and artistic venue for the community. The entire TASIS Dorado community has been busy fundraising with events such as the "Walk for the PAC" that raised over $40,000.